What were practice facilities like for a golf-mad boy growing up in Edinburgh in the 1960s? We didn’t have a driving range as such at Bathgate Golf Club when I was growing up. We used to just sneak onto the side of fairways on the course, far away from the pro shop, and practice chip shots to the green. I was a junior member, so it wasn’t like I was jumping over the fence for free, but in those days I found the course was the best place to practice, as they were real situations. Do you think the practice facilities like the ones at World of Golf will help uncover the next generation of stars? The way golf is going, with fewer and fewer people becoming members of clubs, and fewer people having the time to play a full round, it’s becoming increasingly likely that future generations’ only experience of golf will be at facilities like these. Families can come here for an hour or two, practice their putting, chipping and general play, have a lesson, check out all the new equipment, play a game of crazy golf, have a snack, and generally have a fun few hours together. It’s certainly a great way to get started in the game, so when players do, hopefully, manage to experience a proper golf course, they won’t feel quite so intimidated. It’s really a marvellous facility – I only wish I had one around when I was a lad. Talking of game improvement, what is your view on the PGA of America’s decision to create a task force to raise the standard of America’s performances in the Ryder Cup? It’s all a massive over-reaction. It will swing back America’s way if they don’t panic, but that’s exactly what they seem to be doing. The task force just looks a publicity stunt to me. America lost the Ryder Cup at Gleneagles because they lost the foursomes matches 7-1. How’s a task force going to help on that? During my time, the US team had presidents who kept in the background, but now they want to get involved and help, but in reality it has the opposite effect. It should be all about the players. Was Tom Watson the fall guy, or did he make some bad decisions? The appointment of Tom Watson didn’t work – full stop. There was clearly a generation gap between Tom and his players, and it made for a marked contrast with Paul McGinley, who was one of the boys and the European players really wanted to play for him. The US was looking for a inspirational figure to break their losing run, but what they really needed was someone who the players could relate to, and who knew their games, not a guy whose playing days on tour were decades ago. What did you make of Phil Mickelson’s outburst in the immediate aftermath of the defeat at Gleneagles? Phil is a lovely guy, but it surely needed someone to tap him on the shoulder and say, ‘We all appreciate your passion and you’re trying to help, but your timing is completely wrong’. I would have been very disappointed if one of my players had done that. Phil must surely regret his actions in the cold light of day. Of course, he had some valid points, but it was the wrong time and the wrong place to start pointing fingers. What would you do to improve the US team’s chances? I’d certainly get rid of the wildcards. I don’t know why they copied the Europeans on that one. We had to do it because a lot of our players were competing in America, but the Americans should just take the top 12 off their order of merit after the FedEx Cup. That way you’re letting every player know exactly what he needs to do to make the team. They also need to stop over-reacting. The American college system is too strong not to turn out more great golfers. They were without key players in Tiger Woods, Dustin Johnson and Jason Dufner. What a difference they would have made. And look at Medinah, where they lost by a whisker, or Celtic Manor in 2010, where they won three of the four series of matches. They’re acting like they’re a million miles away, which they’re plainly not. Your nephew, Stephen Gallacher, made his Ryder Cup debut at Glengeagles. How do you think he coped with playing in front of a home crowd, and so many supporters? The whole family was obviously enormously proud of what Stephen achieved in getting picked for the team. He put in a lot of hard work, and had to cope with numerous illnesses and injuries, and he got the reward for all his efforts. The Ryder Cup is incredibly difficult event to play in at the best of times, but doing it in front of a huge crowd in your own back yard piled on even more pressure. Obviously his matches don’t go the way he would have liked, but we’re all still tremendously proud of what he achieved. 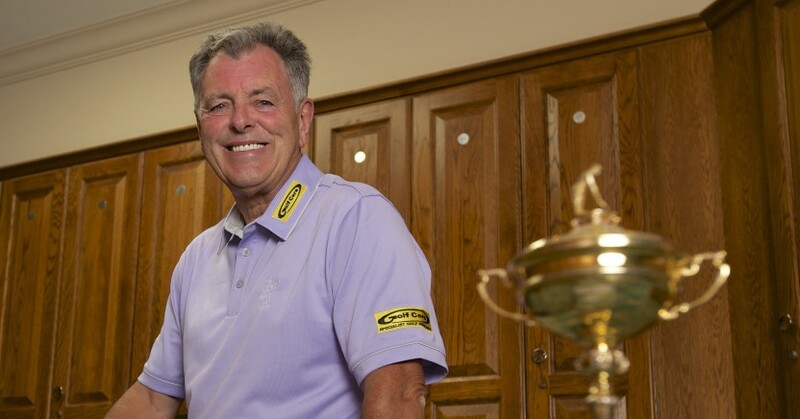 It was brilliant for him personally, but also brilliant for Bathgate Golf Club, which now boasts three Ryder Cup players, in Eric Brown, myself, and now Stephen. It’s an amazing that such a wee club could produce one Ryder Cup players, let alone three. What is your abiding memory of your first taste of Ryder Cup golf at Birkdale in 1969? I remember playing in the morning foursomes with another rookie, Maurice Bembridge, and we beat Lee Trevino and Ken Still 2&1, which was a huge result. It all got a bit niggly, and I remember Ken standing very close to Maurice on the green when he was putting, which wasn’t very sporting. I also beat Trevino in the final afternoon’s singles matches, 4&3, which was a feather in my cap, but we ended up drawing 16-16 – the first time the matches had ever been tied. However, there is no comparison between what I experienced on my debut and what Stephen went through at Gleneagles. I think there were maybe 400 accredited media at the matches last month, while In my day, you walked into the press room to find that Jock McVicar and Norman Mair were about the only two reporters there. The whole event is almost unrecognisable from the ones that I played in. Who would you like to see captaining Europe in 2016? There seems to be a strong call for Darren Clarke to take it on, and I see no reason to look beyond him. His Ryder Cup record, and his general standing in the game, makes him the strongest candidate. He has also played a lot of golf in America, which also tips the balance in his favour for an away leg. Have you written off Tiger Woods as a dominant force, or has he still got some majors left in the locker? Once he gets his full health back, I think we will start to see Tiger will play well again. People forget that last year he won five tournaments, and was the PGA Tour player of the year. This year his fitness has not been good, with his back and knee troubles, but if he is able to get his full health back, I don’t see why he can’t start challenging for the majors. I think we’ll know where he is at the Masters next year, because if he is going to win another major, I think it will be at Augusta. It’s a course he loves, and one that suits his game, so if he comes back at the Masters in April and gets into contention and maybe win it, then I think we can say that he’ll start to threaten Jack Nicklaus’ record of 18 majors. If Tiger slips up, do you think Rory Mcilroy has a good chance of bagging his career grand slam at Augusta? Rory may never have a better chance to win the Masters than in April. But he is putting that opportunity in jeopardy if he ends up spending weeks in court fighting his legal dispute with his former management company. The only real winners will be the lawyers for both sides. Rory’s sole focus should be on peaking for that second week in April. He is 25, the best player in the world, and he was unstoppable last summer. He wants to be out on the course or practicing, not having meetings with lawyers. In these austere times, the sight of multi-millionaire golfers arguing over the percentages of lucrative contracts does not portray the sport in a good light. I just hope any court victory is not at the expense of the one we want to see at Augusta. How’s your own game these days after your health scare last year? I’m officially retired from the game now, from a competitive point of view, but I’m fine. I’m back playing golf, going to the gym, and driving again. I practice down at Wentworth every week and I am as fit as I’ve been in a long time. Thanks to modern equipment I can still get the ball out there, although my swing isn’t quite as fast as it once was! You’ve launched a campaign for all UK golf clubs to invest in defibrillator machines and train up staff to use them. How’s the campaign going? I consider myself incredibly fortunate that a defibrillator was on hand to resuscitate me following my cardiac arrest. But for that, and the expertise and life-saving skills of the medical personnel in the room that night, I wouldn’t be here today. Without early intervention, an individual has just a 5% chance of surviving a sudden cardiac arrest, so my wife Lesley and I felt it appropriate to try to ensure others are equally fortunate should they collapse in or around a golfing venue in future. Currently, just 30% of golf clubs have a defibrillator and our aim is to try to raise awareness of the importance of having an AED close by in case of emergency, and to increase that figure considerably by encouraging every club or driving range in the UK and Ireland to have at least one public-access defibrillator by the end of 2014. Cardiac arrest can happen to anyone at any time, and possibly on the golf course. We want to do whatever it takes to raise the level of awareness of defibrillators and to get them into more clubs around the country. As the former head professional at Wentworth, what was your reaction to the club being sold? I think Richard Caring felt that he had taken the club as far as he wanted to, and that the time was right for someone else to take it on. Richard has other business interests that he wants to focus on. I’ve met one of the new owners at the club, and nothing will change from day to day, as far as I know. All the same people are running the club, from the chief executive, Julian Small, to the guys working in the pro shop. Reignwood, the new owners, have obviously got experience of running high-end golf clubs in the Far East, so I’m sure it will do a great job continuing the great traditions at Wentworth.